This site is an outcome of the Comenius 2008-2010 multilateral project "European Journey Through Legends". "Becoming more European does not mean forgetting our national cultural heritage, but sharing it with other European nation". 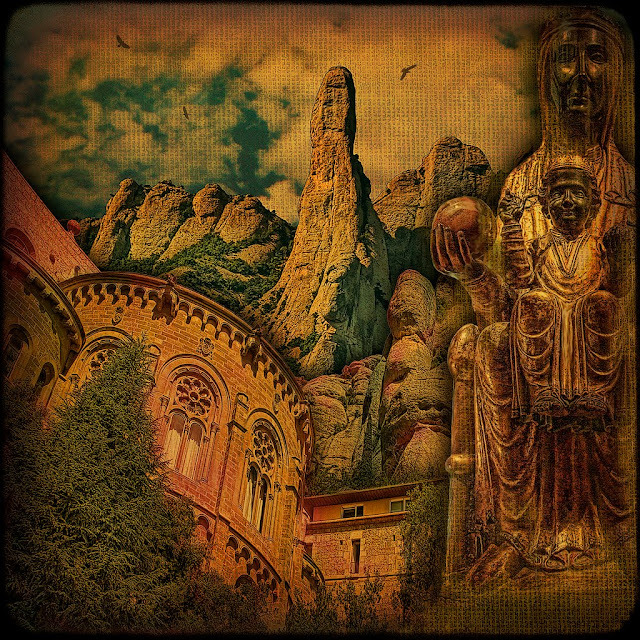 The mountain of Montserrat has always been a source of inspiration for myths and legends because her singular form, but maybe the most important and popular is the legend of the “Moreneta”, the Dark Maiden, the Virgin of Montserrat. 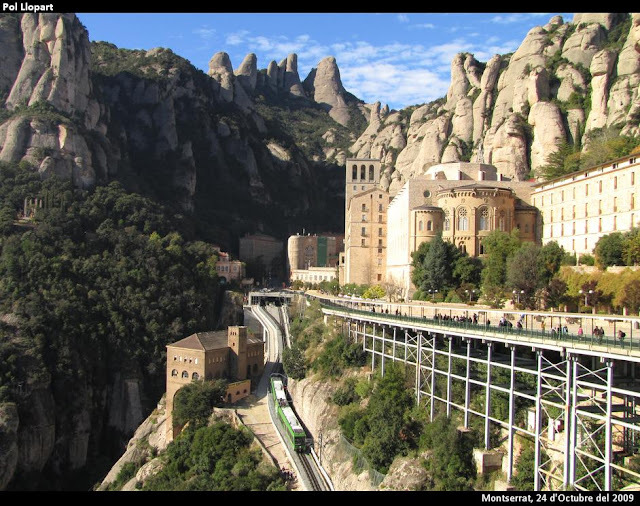 The word Montserrat, means "jagged or serrated mountain" in Catalan. The mountain is also called "La muntanya dels cent cims" (The mountain of 100 peaks) and is composed of strikingly pink conglomerate, a form of sedimentary rock, popular with climbers. 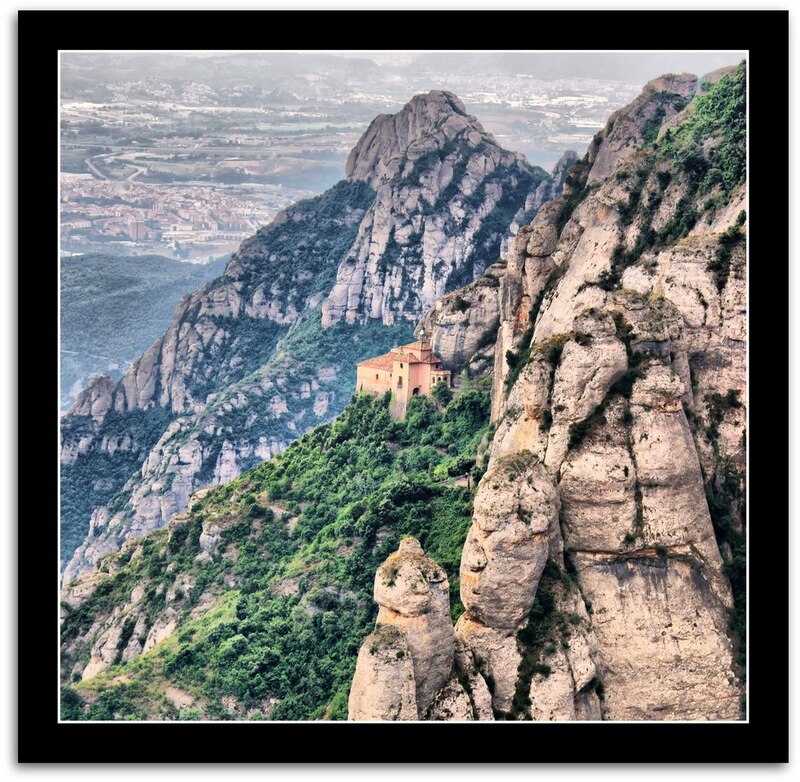 The summit of Montserrat is called Sant Jeroni (Saint Jerome) and stands at 1,236 meters (4,055 feet) above the valley floor. 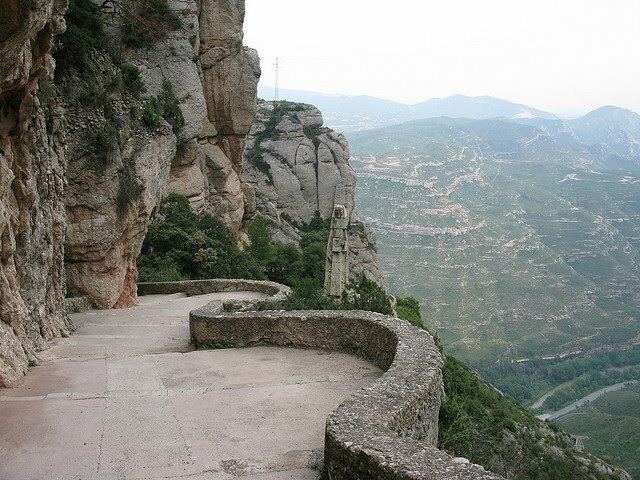 Montserrat, is the highest point of the Catalan lowlands, and stands central to the most populated part of Catalonia, not so far from Barcelona. On a rugged carved mountain not far from Barcelona lies one of the most popular destinations of the Catalan region and Spain: the statue of the Black Madonna. According to the legend, the statue was discovered in the year 880 by some shepherds who have seen a strange light on the sky and heard music coming from a cave in the mountain. From that moment on the statue remained on the Montserrat mountain becoming one of the most famous pilgrimage sights in Spain. The statue became more and more famous after people started reporting miracles and attributing it mystical healing powers. 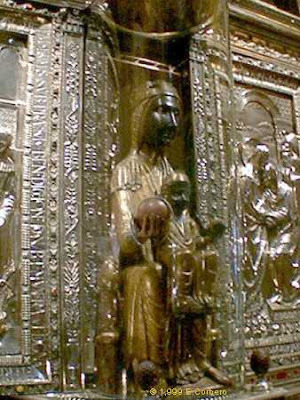 In 1881 the Montserrat Madonna was crowned in accordance with Canon Law and proclaimed patron saint of Catalonia by Pope Leo XIII. Its fame still attracts flocks of pilgrims who come to the sacred mountain either to take part at the monks’ daily celebrations of Mass and recitations of the Liturgy of the Hours either to visit the Basilica, next to the monastery, to see La Moreneta. Sacred Cave: this is where they evidently found La Moreneta. There's a replica there now. 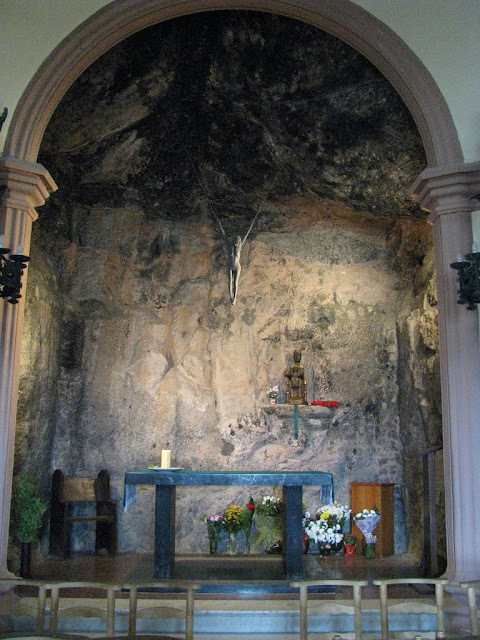 The Holy Grotto (Santa Cova) were the statue was discovered by the shepherds can be visited by following the walking paths or taking the funicular. 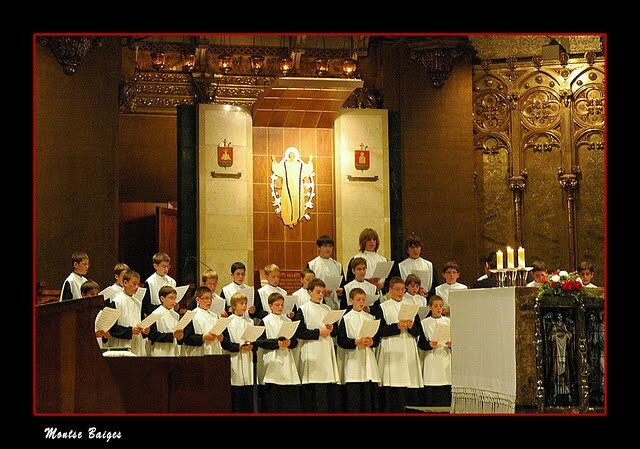 Another attraction point of the Monastery is the 50 member Escolania, one of the oldest and the most famous boys’ choir in Europe. 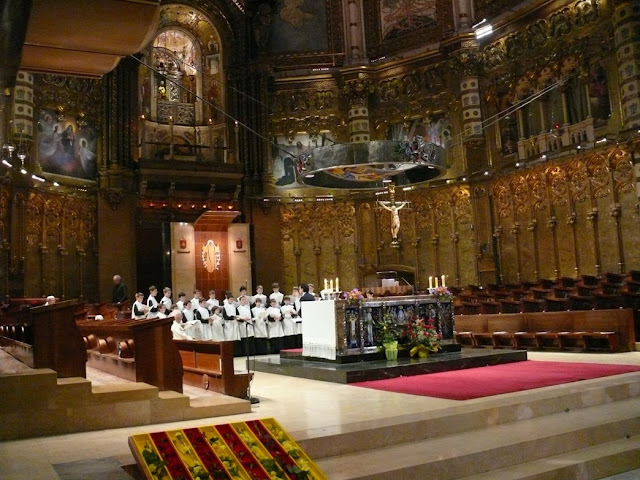 The choir dates back from the 13th century. At 1 pm daily you can hear them sing "Salve Regina" and the "Virolai" (hymn of Montserrat) in the basilica. There are many stories about the black Madonna and the mountain, who many believe to be magic and some say she guards the Holy Grail, but we can never deny that she will always be the symbol of joy and hope for millions of her worshippers. The Legend of Montserrat: The "Moreneta"
A legend of year 1239 tells that, at dusk from a Saturday of year 880, a great light descended from the sky, and whose brilliance left ecstatics young shepherds that contemplated the event; formidable brilliance was accompanied of beautiful angelic melody as background music. 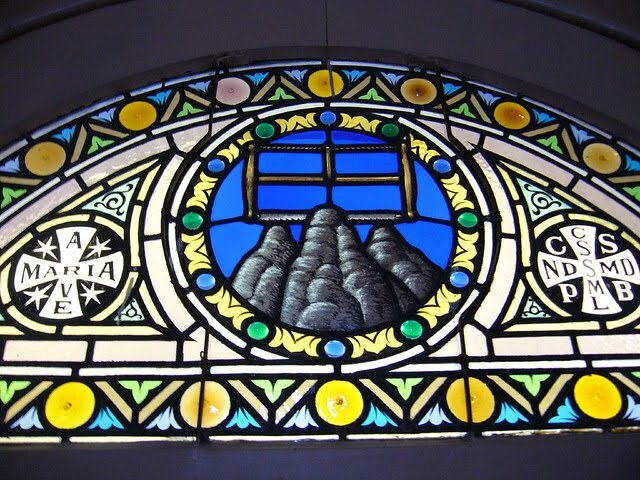 Following Saturday the children returned to the same place of the event accompanied by their parents, and the moving vision was repeated; the same it happened four following Saturdays, when it accompanied the vice-chancellor of Olesa de Montserrat, and all together stated the same and surprising stellar wonder. The bishop, who by those then was in Manresa, would not take in having the news of the happened thing in the mountain and this one did not doubt in raising its top to verify the facts with its own eyes; in the expedition a natural cavern was discovered: Santa Cova, in whose interior they found an image of Maria with the Boy in his lap, with the face and hands of black color. Gotmar, the bishop of Vic, did not doubt in proposing that outside transferred to Manresa; but it was as soon as to remove it from the interior of the cave, when the image became so heavy that there was no form to move it of the ground; the interpretation for the bishop was easy: the will of the Virgin was to remain in that sacred place; reason why it endorsed the divine will and it decided to construct a chapel so that Maria was venerated in the mountain of Montserrat. According to the legend, “the Moreneta” (the brunette), was carved in wood burned by the effect of a ray, by the same San Lucas in Jerusalem and brought to Catalonia by San Pedro, later being deposited in the church of San Justo, to be venerated by Santa Eulalia and San Oleguer; the image, well-known like “the Jerosolimitana”, would be hidden at the beginning of century VIII because of the Muslim invasion, taking it to Montserrat, where it would be hidden in Santa Cova, remaining there hidden until the 880, year of the phenomena of the strange lights. This is the legend but the truth is that many historians have done hypotheses about this subject, and the most accepted is that the Virgin was hidden in the cave by some monks to avoid that the Muslims found it and burned it. 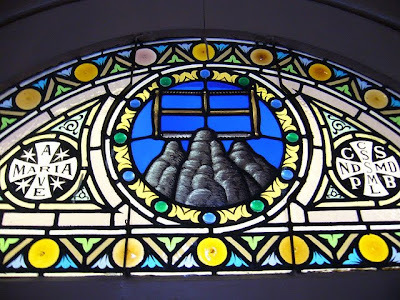 Some years after, some pastors saw a shooting star and they found the cave and the statuette. The bishop built a monastery and the rest of the story is a legend. This site reflects the views only of the authors, and the Commission cannot be held responsible for any use which may be made of the information contained therein.